Evil is not ugly. You cannot tell, simply from looking at a man, what colour is his soul. For most of his life, Daniel has known only the company of his mother - a silent, reclusive woman who has hidden him away from the outside world. Then a forceful knock at the door changes everything and Daniel realizes just how many secrets his mother has kept from him. The young members of the Historical Association gave The Devil Walks some rave reviews. Why did I write The Devil Walks ? That there's no Devil, and that youth is bliss? I've no idea why I couldn't get the lines out of my head. Indeed, one early draft of another of my novels, The Tulip Touch , at first had a passage describing a place behind high hedges, referred to as the Devil Walks, where in earlier times the man of the house could stride in a temper, free of the fear of scandalising the ladies with his curses: "The devil take him! Damn him to hell and back!" Anne also talked to 'We Love This Book' about scary stories, and to the Reading Zone about which aspects of the novel she is particularly pleased with: parents and teachers might find this interview helpful. Now Anne has adapted The Devil Walks as a playscript. It was published as an Oxford Playscript by Oxford University Press in January 2013, ISBN: 978-0-1991-3801-2, and is also available from Amazon. "a gothic thriller set in late Victorian England. It depicts quite a number of taboo subjects, among them evil, voodoo, the devil, child abuse, fractured identity, maternal madness and suicide, all with delicacy and sensitivity. There is a beautiful portrayal of Daniel, the youthful victim, hero and narrator of the book. Good wins out in the end, but at the huge cost of destroying the legacy of the past. I recommend this for older rather than younger teens. Its opening is truly terrifying, but it is thought-provoking and my favourite of this year's crop." "...perhaps one of her best so far, rich in period detail, with fine-tuned utterly believable characters and a real sense of menace constantly bubbling away under the surface." "Boys and girls who have enjoyed reading Ms Fine's earlier gentle works such as Goggle-Eyes , Flour Babies and Madame Doubtfire are likely to be absorbed by this new direction for her, with a mixture of frights, twists and turns as the plucky young hero seeks out the answers." "Feels authentically Victorian, has a wonderful sense of menace and threat throughout and a superb growing sense of doom. Read it, but keep the lights on!" "a superb and subtle writer...a joyful marriage of style and content... The Devil Walks is immediately a classic in its own right." Warning: this review gives away quite a lot of the plot; you might enjoy it more after you've read the book! "I'm not sure I blinked once when reading The Devil Walks by Anne Fine. Narrated by its protagonist, a boy brought up as an invalid by what we assume is his Munchausen mother, it is a pitch-perfect Gothic thriller, complete with wicked uncle, sinister doll's house and a voodoo doll that when played with always turns games nasty. Come to think of it, I didn't breathe either." "Recommended, but not for a dark and stormy night." "There's a real Turn of the Screw feel to this absorbing ghost tale, a genuine Gothic spinechiller, and beautifully told"
Now read on! A splendid child's introduction to the gothic." "Chilling, creepy and utterly compelling, The Devil Walks by Anne Fine is a finely crafted tale about young Daniel who, confined as a child by his mother, is rescued by a kindly doctor and reunited with his unpredictable uncle, when he uncovers the alarming truth behind his mother's past and the doll's house she cherished. Fine creates a wonderful sense of place and the devilish Captain Severin will long haunt your psyche. A satisfying summer read for those who like to be spooked." 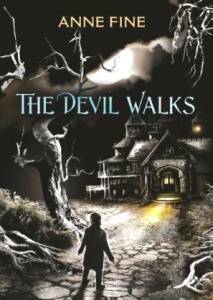 "Crackling with suspense, The Devil Walks is a dense psychological thriller set in a richly imagined past. Moody and unsettling, it is filled with intrigue and uncertainty to keep readers guessing until the last page. The past comes to life in this sparsely told novel, infused with subtle comment about child welfare and not to be missed." Order it in hardback from Amazon, or from any bookshop or library, quoting the ISBN: 978-0-85753-064-6. The Devil Walks is now also available from AudioGO as an unabridged audiobook read by Bill Wallis, and in a large print edition (ISBN: 978-1-4458-7494-4) available from the Large Print Bookshop.